The July 24 temperature, in turn, broke the record of 40°C (104°F) that was set in 1942. I think I am living in a tropical country," resident Cho Hyun-soo told The Korea Times. "I just came from my break in Bangkok, and it was 34 degrees (93.2°F) there. The weather in Southeast Asia is much cooler than in Korea. I don't know where I am living." The unusually long and intense heat wave follows a rainy season that lasted only 16 days, which is half of the normal average. Forecasters expect that the heat in South Korea will continue for the next few days with little rain in sight. 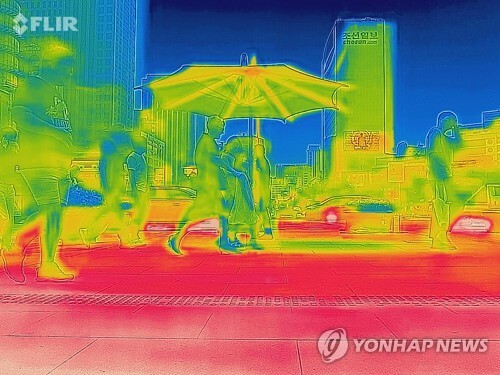 So far, at least 28 people have died and more than 2,200 others have been treated for heat-related ailments, according to the Yonhap news agency. Because heat-related deaths are historically under-reported, the true death toll is believed to be in the hundreds or thousands.